This Gold Card Limited Edition collection features the Disney characters riding on a purple Monorail. 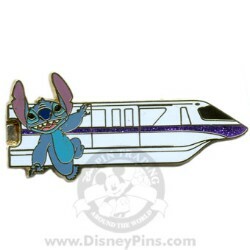 This pin features Stitch. The (5) pins in this collection can be hooked together to form a long Monorail train.